A couple weeks or so ago (yes I know a bit delayed in responding – the holidays really threw me off this year!) 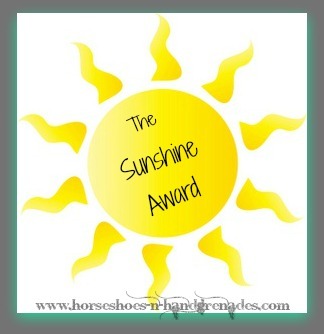 I received an e-mail from Bonnie the Lady Blogger letting me know she had nominated me for the Sunshine Award which is sort of a really great way to get to know more about other blogs and bloggers that are out there. I was totally shocked and to say the least and absolutely thrilled that she felt Horseshoes & Hand Grenades was a worthy recipient. Some of you may know, but for those that don’t there are some rules that go along with being nominated for the Sunshine Award. Thanks and recognize your nominating blogger, so again, thank you so much Bonnie! Answer the 11 questions given by your nominating blogger. Nominate 11 bloggers that do not include your nominating blogger. Now that’s a pretty extensive list of items to be covered so we should all know each other pretty well by the time we’re done! Let’s get started shall we? I don’t like speaking in front of people, I’d much rather put what I have to say on paper, which I guess makes me a pretty okay blogger. Public speaking is one of the things I want to work on though – you know become a better rounded person or something. My kids are roughly 10 years apart. I have an 11 ½ year old son and my daughter just turned 2. It’s kind of a crazy span of ages but it really works for our family. I HATE driving over bridges (or riding as passenger). Walking over them, no problem, but put me in a car on a bridge and its closed eyes and white knuckles all the way. Three of my cars have been totaled, but I was never the one that totaled them and only actually in the car once when it was totaled. Needless to say I am very picky about lending my car out or letting anyone else drive anymore. I have a miniature donkey named Redonkules. He’s a sweetie and kind of just a novelty pet to be honest. He hangs out with our miniature horse, Squirt, pony, Sister, and full size Missouri Fox Trotter, Sassy. I am obsessed with The Walking Dead and Supernatural, but I haven’t seen the most recent season of either yet because I refuse to pay for cable or satellite so I’m always a season behind on both until it comes out on Netflix. I love Marilyn Monroe. My entire living room is covered with Marilyn memorabilia and fortunately my husband humors me and doesn’t care if I accessorize the main room in the house with pink, rhinestones, and zebra print. But that’s the only room I get, the rest must be manly to compensate. I’ve been at my “real” job as an Insurance Agent for almost 13 years. Same office, and mostly the same co-workers. I have 8 tattoos and currently have 4 piercings (I used to have 7 but took a few out as I’ve gotten older). I will probably get more tattoos, but I think I’m done with piercings. I’ve only been out of the United States once and it was on a band trip to Canada when I was in high school. I’m not even sure if that really counts as international travel. I kicked around the idea of starting a blog for probably two years before I decided to do it. Now that I have I kick myself for not doing it sooner and doubting myself because I love blogging so much and am having so much fun doing it and networking with new people. What is your favorite thing to write about? Everything, I’m a blogger without a niche so I love to write about whatever I’m feeling most passionate about on any given day and that can be a wide range of things. Sometime it’s the kids, preparedness and survival, or maybe just the rant of the day. You never know what you’re going to get when you stop by Horseshoes & Hand Grenades! What is your favorite vacation spot? To be honest I haven’t done a TON of traveling but I have to say I love when I get to go to Texas because I get to see family and friends that I don’t see very often so when given a choice, that’s honestly where I’d probably go. If it’s just hubby and I off to have fun a few days in Las Vegas really makes you forget the “real” world for a while so that’s pretty awesome too. What is the hardest thing you’ve ever done? Hands down telling my son (who was barely 4 years old at the time) that his father had passed away in a car accident and he wouldn’t see him again and trying to tell him in a way that he somewhat understood. It was heart wrenching especially since I still hadn’t really wrapped my head around it and accepted it. Cold side or warm side of the pillow? Cold, but the rest of the bed / blankets need to warn – weird right? What time do you wake up each day? Earlier than I’d like! Usually around 6:15am on a work day, about 8:00 on weekends if the toddler allows us to sleep that late. Do you exercise alone or in a group? What’s exercise? That’s one of those things I intend to do better on, but it never makes it to the top of the list – sad but true. When I do exercise though I prefer to do it alone or with my hubby. What is the last book you read? The Mother of All Meltdowns; definitely one that anyone who is a mom, knows a mom, has a mom, or ever wants to be a mom should check out. Favorite thing to cook? Anything that I actually have time to cook that doesn’t come from a box. I like to cook but don’t have the time to really cook as often as I’d like so when I do get a chance to make a real, home cooked, meal, it feels pretty good. Were you named after someone? Who? Not a person, a song, Alison by Linda Ronstadt. What is your favorite movie? That’s a tough one because it changes from time to time, but the ones I can watch anytime regardless are Grease and Dirty Dancing (thanks Mom!). Where do you call home (and that doesn’t necessarily have to be where you currently live). Large family or small? How many siblings? Do you prefer a Big City or Country lifestyle? If you could travel anywhere and money wasn’t a factor, where would you go and what is there that you want to see? What’s the most difficult time in your life? The happiest?